Charity fitness events have become a major staple on our social calendars. As a society we are always looking to constantly challenge ourselves both physically and mentally while doing something for a worthy cause. Tough Mudder, Spartan Race, The Color Run, Mother’s Day Classic and the Run for the Kids are just some of the events that thousands of people participate in annually in the hope of beating last years’ time while raising money. The Eureka Stair Climb is Australia’s biggest vertical race held at one of the world’s tallest residential buildings, Eureka Tower in Southbank, Melbourne. Held on Sunday 16th November, it will play host to thousands of entrants all hoping to raise money for Interplast and Whitelion, two worthy charitable organisations committed to helping disadvantaged young people. Covering 1642 steps over 88 floors while rising to a height of 300m this is a challenging event that requires some specialised training to help you get to the top. So, if you have been thinking of taking on the Eureka, where do you start? The first thing you need to take into consideration is stairs. Lots of stairs! Incline cardiovascular training is the most important thing to focus on as this will allow you to pace yourself and get to the top of the Eureka Tower. Having access to a stair case where you can run up a few flights at a time will help you progress your fitness levels. It would be ideal to have access to an elevator as well to make the trip back to the bottom to start again as running downstairs does place a lot of pressure on the knees. Utilising the use of the incline levels on a treadmill will also help you prepare for the event. Start by running up the stair case 3 floors at a time, stepping on every 2nd or 3rd step, depending on the length of your legs. Take the elevator back down (or walk down) and repeat the process. If you believe your fitness levels allow it, go for 5 or even 8 flights of stairs at a time and repeat this process for no more than 30 minutes. Take 2 minutes rest in between runs. If you only have access to a flight of stairs at your home or in a park which may be limited in height, that’s ok, you will just need to limit your rest times. The reason you want to limit this to 30 minutes is that is the time that it roughly takes the average person to complete the stair climb. If you’re up for the challenge of competing with the best, be prepared to try and get your climb time under 15 minutes! Set your treadmill to a steady running pace that you are comfortable with then progressively increase the gradient on the treadmill to make it harder and harder without going faster, you may even have to slow down at first as your fitness levels may not allow you to run uphill for an extended period of time. Do this for about 10 to 15 minutes. Another way of training on the treadmill is to set the gradient at a manageable height and do interval sprints. In this instance the gradient stays the same but you alter the speed according to your abilities. Complete these sprints with a timing of 20 seconds on, 40 seconds off. These 2 types of treadmill training will help improve your cardiovascular fitness to enable to you complete the course. Resistance Training is also important when preparing for the Eureka. This workout can be completed as a superset indicated by the lettering A1 & A2, B1 & B2 then C1 & C2. This workout is a combination of upper and lower body as you need to strengthen the posterior chain of the lower body while also working the upper body as this will help in propelling your body up those steps. Focus on keeping the weights challenging enough that by the last repetition it should be a struggle to complete. Keep a nice steady tempo so you are not rushing through the workout. If you are completing this resistance training session in conjunction with one of the cardiovascular activities make sure to complete the resistance training first as you don’t want to fatigue your muscles and joints with cardio first. If you were to train between 3 to 5 days a week these guidelines will assist you in completing the stair climb in a good time. You may want to split the training sessions into 2 resistance training workouts a week and 3 to 4 days performing the cardiovascular activities. It is important that you don’t overdo it so take 1 or 2 rest days during the week. You could also consider including some specific functional exercises into your training routine such as walking lunges chained with medicine ball rotations, combined cable push/pull rotations and weighted sled pushes. These will assist your single leg propulsion and rotational capacity at the same time. In the week leading up the event it is also a good idea to take 5 days off to allow your body to recover and be in great shape for the stair climb. The focus with these events should be to better yourself (as well as support charity), so set yourself a goal and go for it. Whether you come first or last is not really the focus, it’s just making sure you have improved your fitness as well as your outlook, and had fun while doing it! Article written by Daniel Kraljevic, AFA’s Student Support Officer. Daniel is a former professional basketball player who turned his passion into a career in the health and fitness industry by becoming a Personal Trainer. With his professional basketball background, over 5-year’s experience as a Personal Trainer and 2 year’s in Management, Daniel has a vast range of knowledge and practical experience to impart as a Course Lecturer and Student Support Officer. Daniel is passionate about training and educating people – clients, trainers and people who are wanting to enter the industry. He is dedicated to influencing the fitness industry in a way that will produce successful high quality fitness professionals ready to enter the competitive industry. 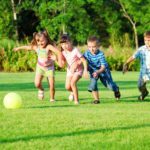 Training Children – Keep them Captivated!